The weight of the frame itself means that either it has to be floor mounted, or else some form of support needs to be constructed to enable the loop to be rotated without being physically lifted each time. Wooden frames tend to flex when moved and can change size dependant on the climate which can make the windings loose or become too tight. This is quite a problem if you need to pick the loop up to rotate it. The constructional difficulty of a wooden frame, making joints and drilling holes or cutting slots can be off-putting for someone who, like me, is not into Do-It-Yourself. To make a wooden frame is fairly easy, to make a good wooden frame is NOT. I sought an easier alternative that would give me a loop of a reasonable size that could be easily rotated, was cheap and easy to construct and gave good DX performance. Thus the Hula Loop was born. The Loop Framework. For the loop construction, I used 2 plastic children’s hula hoops (purchased for about 2 US Dollars each). The windings were made from multi strand hook up wire (single strand could be used). For the cross and down supports, 2 lengths of thin bamboo cane were used. These are fixed to the control box with thin bolts and nuts. First of all we need to make the frame. If you use 2 of the hoops joined end to end to form a larger hoop, the diameter can be up to about 5 feet which was a little too large for this location. I trimmed one of the loops down until the overall diameter was just over 4 feet. These hoops come with an in line joiner, so no glue is needed, which makes things even easier! Attackhing the Cross Braces. Now we need to attach the cross brace support. Take a length of bamboo cane and measure across the widest part of the loop, Cut the bamboo cane so that it will fit across the widest part of the loop snugly and without distorting the frame. Next the cross brace needs to be secured to the frame itself. Cut a small square through the outside of the plastic frame (where the cross brace meets the side), so that a screw can pass through. Use a small self tapping screw and gently screw through the inner of the plastic frame and into the end of the bamboo cane. Do not over tighten! A drop of glue may be needed to secure the mount, although mine was fine without. To form the rest of the "T" mount (refer to the main photo), take a second length of bamboo cane, and measure so that you have about 10-15cm protruding at the bottom. How you attach the cane to the cross member is up to you, my method was to drill a small hole through the canes and use a thin nut and bolt (with large washers, so the cane doesn’t split when the nut is tightened) to attach the tops together. For the bottom, I did the same except that the bolt passed through the plastic frame. I used metal hardware but purists would recommend the use of nylon. Personally I have not noticed any disadvantages by using metal. Tilting the loop is simple. I had previously used a discarded monitor base and a jack plug/socket arrangement for rotation which worked very well but I soon found that it had limitations and was inconvenient as the loop had to be raised off the ground in order to reach the controls. The new method is to mount the loop and control box onto a camera tripod by screwing the ‘shoe’ into the base of the control box. 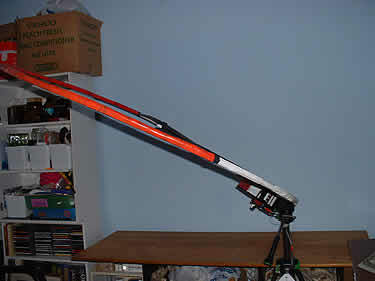 This gives a secure mount that allows full rotation AND tilt. With this arrangement I can tilt the loop from vertical through to horizontal, which can give a much deeper null on some signals. This also allows me to position the loop at a convenient height so the controls are within easy reach. The Main Winding. Having made the loop frame, the next thing to do is to attach the main winding. Tape one end of the hook-up wire to the bottom of the loop (wherever you decide the bottom will be), leaving about 30cm free for connecting to the tuning capacitor. Make sure you put a few turns of tape (electrical PVC type tape is fine) to firmly secure the end. Slowly feed the loop through your hand while keeping the wire fairly tight and wind on to the loop. Secure the wire every 30cm or so with a single turn of tape (ensuring that the wire is kept tight against the loop). Keep doing this until you have laid 5 complete turns on the loop frame. When you reach the end of the 5th turn, secure with a few turns of tape and leave another 30cm length for connection to the tuning capacitor. At this point it is worth marking the two ends of the winding as "MAIN", because the coupling turn will be wound over the top of this winding and, unless you use a different colour wire, the two could get confused when you are ready to connect everything together! This comes from bitter experience! The Coupling Loop. The coupling loop is a single complete turn and is what will connect to your receiver. Wind the coupling loop in exactly the same manner as the main winding, again leaving 30cm tails. Mark this one "COUPLING". 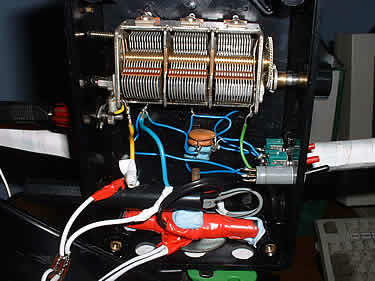 The reason for using a coupling turn instead of connecting the main winding directly to the receiver is that a coupling turn acts like a 5:1 step down transformer and provides a much better impedance match to the receiver than would be possible if the main turn were connected directly. This improved impedance match allows a more efficient transfer of signal from antenna to receiver. Using a coupling loop does have other advantages, i.e. the tuning range is unaffected by the receiver input impedance and the "Q" of the loop (sharpness of tuning) is not reduced, as would be the case if the receiver were connected directly across the main loop/tuning capacitor assembly. The two free ends of the coupling loop should be connected to a length of feeder terminated in a plug suitable for your receivers antenna socket. You can use twin wire (Bell wire) or coaxial cable for the feeder. I have used 50 ohm coaxial feeder with my loop and have not noticed any degradation in signal/directivity compared to twin "balanced" feeder. If you intend to use the FET amplifier, make this connection temporary as the output from the loop will connect into the amplifier, and so needs to be much shorter. The output from the amplifier would then connect to your receiver. Attaching The Tuning Capacitor Network. The tuning capacitor is placed in parallel across the main winding and will not be physically connected to the receiver or amplifier. The tuning capacitor is what brings the loop alive. It is possible to use almost any type of variable capacitor, but my preference is for the old style air spaced variables that were found in older radios. These capacitors normally have 2 or 3 "gangs" or sections, which can be joined together to increase capacitance. For my loop I used a 3 gang capacitor of unknown value. I would recommend using at least a 2 gang type, preferably of 250pf per section, or more. To add flexibility to the tuning, I put switches in so that I could use 1, 2 or all 3 of the gangs on my capacitor. Additionally I added 2000pf of fixed capacitance through another switch, which extended the tuning range down to 360kHz. The extra capacitors are added in parallel, which increases capacitance, thereby lowering the resonant frequency of the loop. The tuning range of the loop will depend on the value of the capacitors and to a certain extent the way the main winding was wound. 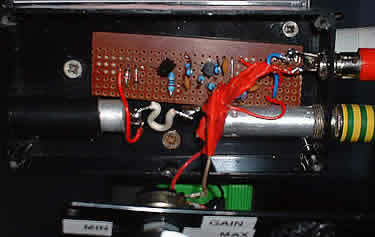 In the picture, the red tube at the bottom of the control box is a MW ferrite rod and coil assembly from a discarded portable radio. Switching this in series with the main winding allows the tuning to extend down to 196kHz. Sensitivity is not as great at lower frequencies, so the pre amp really helps. Now that the two windings have been completed, the main winding has been connected to the variable tuning capacitor (and fixed capacitors if added) and the coupling turn has been connected to a feeder, we are ready to begin testing. Plug in the lead from the coupling loop to your receiver. Set the receiver to a known strong station at about 900-1000kHz (mid range of the band) and very slowly rotate the tuning capacitor until the signal peaks. You should notice a very marked difference in signal when the loop has been correctly tuned. If you cannot peak the signal, check that the coupling loop has been connected to the receiver and that the tuning capacitor is across the main winding. You may need to use more or less sections of the capacitor to achieve resonance, dependant on the value of the capacitor. A little experimentation should soon solve any problems. To check the tuning range, use just one section of the tuning capacitor without any additional capacitance (this will determine the HF limit of your loop). Set the capacitor as above and tune the radio until you hear a peak in the background noise, then continue tuning first the capacitor and then tracking up with the radio tuning until the capacitor is at the end of it’s travel. It is possible that the upper tuning limit of the loop is higher than your receiver covers, in which case you need to follow the procedure below. Adjusting The HF Tuning Limit. Should you find that the loop does not tune to a high enough frequency, remove a single complete turn. If it should tune too high, add complete turns until the desired frequency is reached. The reason for adding/removing only complete turns is to preserve the loops null symmetry. My own loop tunes up to over 2MHz, thus covering the 160m amateur radio band and the 120m tropical broadcast band. To obtain improved MW performance I should add an extra turn to bring the HF end down to about 1700kHz. The extra turn will give increased signal pick up. Adjusting The LF Tuning Limit. To check the LF limit, switch in all sections of the tuning capacitor (and any additional fixed capacitance), then tune down with the receiver and capacitor in the same manner used for determining the HF limit. If the loop does not tune low enough, add more capacitance. There is a limit to how much capacitance you can add, as the tuning capacitor will have very little effect if it is working against a large fixed capacitance. Also the sensitivity tends to fall off due to the lack of inductance, so it may be a better idea to make a dedicated low band loop if you intend to listen to LW and MW signals. I did manage to get the loop to tune to 60kHz (for MSF reception) by adding a LW inductor (complete with ferrite bar) from a scrap portable and switching it in series with the main winding. This wasn’t a very good solution as the loop’s sensitivity was very poor due to the lack of surface area of the added inductance. However it did allow for reception of some interesting long wave signals that had not been previously heard at this location. I have since changed the inductor to a MW type and also connected the coupling winding from the ferrite rod to the coupling winding on the main loop which gives a significant increase in sensitivity at the LF end of it’s range. Tuning now extends to 196kHz. One word of warning if you intend to try that method: when installing the ferrite bar/inductor combination, pay attention to the orientation of the ferrite bar! The maximum signal pick up on the main loop is in line with the windings but with a ferrite bar assembly, the signal pick up changes to being broadside to the windings, so the ferrite bar/coil assembly will need to be fixed at 90 degrees to the main loop winding. If the ferrite bar is positioned so that both coils are aligned, signal pick up will be effectively cancelled out. Frequency coverage. There are no hard and fast rules for determining the exact frequency coverage of a loop antenna. Things like number of turns, surface area of the frame, wire gauge, type, spacing between turns and the value and type of tuning capacitor(s) all play a part. For a square frame of about 1m per side, 7 turns normally gives good coverage of the band. Once you are happy with the tuning range, make the connections permanent and secure the turns with tape. If you intend to use the loop passively (without amplification), attach the feeder to the coupling loop in such a manner that there will not be undue stress on the wire. The Tuning Capacitor photo above shows (somewhat out of focus) the jack socket that carries the connection from the coupling loop to the preamplifier. As this is mounted in a box, there is no movement of the wire, so it wont break. A second jack socket allows the feeder cable to the receiver to be connected directly to the coupling loop, or fed via an amplifier if desired. Larger image of FET preamp. 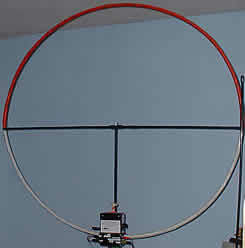 Even with a fairly large loop such as this, on quiet frequencies signals may be heard that are just too weak to be readable. This is when a preamplifier would be of benefit. There are many designs for amplifiers available, some with tuned inputs, others with multi stages of amplification. The idea behind this design was to keep it as simple as possible, as my construction skills are not the best. I found a design by Lyle, K0LR which had a tuned input stage and allowed various antennas to be connected. As this will only be used with the loop, I omitted the switching circuit and as the loop will provide a tuned input stage, that was also removed. The result is a simple, high gain amplifier that really does improve the performance of the loop. Being an FET design, it is low noise (not that that is much of a problem for the listener in a suburban environment!) and it tends not to overload in the presence of strong signals. Obviously the quality of the receiver that you use will determine how much gain you can use before overload etc. sets in. In the original design, I opted to use a switch for high/low gain control but found this to be of little use. This design uses a 10k ohm variable resistor in parallel with R5 which allows the gain to be varied continuously from minimum to maximum. Hence the layout etc. is not as neat as it was originally! The amplifier can be built on a small piece of strip board, the layout is not critical but some care should be taken to keep lead lengths fairly short as some problems may be encountered at high gain levels. Current consumption is around 8mA at 12 volts, so a small pp3 type battery could be used. One thing to note is that the preamplifier is not bypassed if the supply voltage is removed, which means that the loop will appear very deaf if the preamp is left in circuit and not switched on (hence there is no power switch). As I use the preamp all the time, I attach the power supply when I want to listen. I use my shack 13.8v PSU to power the preamp and have experienced no problems at all. I have been using this loop for well over a year now and never cease to be impressed by it’s performance. The directional/nulling properties really become apparent when listening to NDB (Non Directional Beacons) below MW, several on the same frequency can be heard as the loop is turned. After two years of use, I made a few improvements and modifications (like the variable gain control and MW/LW switching). My loop now covers the range 196-2345kHz in four switched ranges. The range below 350kHz is taken care of by the addition of a ferrite bar assembly from an old portable radio. I used the MW coil which is switched in series with the main winding, and connected the coupling winding of the ferrite bar in parallel with the coupling turn of the main loop. This gives additional signal pick up at the lower frequency range, but the sensitivity is no where near as great as if a dedicated LW loop were used. Testing against my other antennas, the loop is two S points stronger on the BBC R4 198kHz transmission (with preamp at minimum gain). If the gain of the preamp is increased to maximum, the loop is better by six S points. Where the loop really scores is in the MW band, where it works best and signals that are S9 on the loop quite often are inaudible on my other antennas. As an aside, quite by accident, I discovered that the loop also makes a pretty impressive active antenna for the SW bands. It is so good that it rivals my dedicated HF antennas. Tuning around on the SSB portion of 80m, I have heard East Coast North Americans on my loop as loud as they are on my vertical. I also logged Jack VE1ZZ on 1.8MHz CW at 579. As I have no other antenna that works properly on top band, a true comparison is difficult but I can say that I couldn’t hear him on the other antennas. The only disadvantage about using the loop as an active antenna on the HF bands is that it does tend to pick up a fair amount of electrical noise, and of course above 2MHz, the directional properties pretty much disappear. That said, if you have antenna restrictions then this could be a way to hear some interesting stations without upsetting anyone. 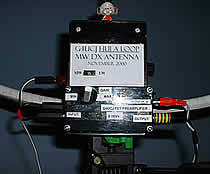 The reason it works well as an active antenna is that the coupling loop is the only part of the antenna that is actually connected to the preamplifier (the main winding/tuning become obsolete and play no part in the action of the antenna above 3MHz), so the actual antenna length used is only about 7 feet (i.e. the circumference of the loop). If anyone builds this loop, I would be interested to see how it compares to other loops, in particular commercial loops like the Kiwa. You may also download a full Hula Loop PDF file from this web site.